Prees Health Camp was a training base for the British Army. It opened in 1915 and had a capacity for approximately 30,000 troops for the purpose of training in trench warfare. During wartime the site developed to include a supplies store, a railway depot and one mile of branch line from Crewe and Shrewsbury Railway. After the armistice the site was downgraded, however, the British Government maintained a presence for the continued purpose of training army personnel. The Lonsdale Battalion was located here for a short period of time. They left their home training ground at Blackhall Camp, Carlisle, on the 8 May. They joined the Glasgow men of the 15th, 16th and 17th Battalions of the Highland Light Infantry, forming the 97th Brigade under the command Brigadier-General Hacket Thompson. The Borders and Highlanders remained here until 22 June when, owing to the unsuitability of the ground for Brigade training, they moved to Wensleydale in Yorkshire. 1939 – Becomes an internment camp for screening Austrian and German refugees. 1941 – Closes 4 October. 1942 – Construction of airfield on site completed. Opened 1 August and named Whitchchurch Heath. 1943 – Site renamed RAF Tilstock, 1 July. 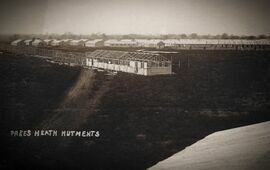 With a knowledge of Storekeeping, are required to fill vacancies as temporary Barrack Wardens and Barrack Labourers for hutments of New Army Divisions at Kimnel Park, near Rhyl, Oswestry, Preese Heath, near Whitchurch and Ludlow. —Cheshire Observer, 12 December 1914. At Prees Heath the work is, of course, progressing - as one would expect it to do, seeing that there is an army of perhaps six or seven hundred men engaged in one task or another in connection with the work in hand. That it is indeed a huge undertaking is obvious to anyone who pays the most casual visit to the Heath, which is fast coming to resemble a wooden city. Apart from the actual hutments, stabling, etc (which when all is completed will probably represent some seven or eight hundred separate buildings) there is an enormous amount of sanitary work to be done, in connection with the water supply, the sewerage, etc. so that it will be some time yet before the camp is ready for habitation. —Whitchurch Herald, 16 January 1915. 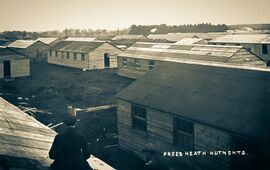 Prees Heath, close to Whitchurch, is now covered with long lines of wooden buildings which have been put up by an army of joiners. Already there are hundreds of hutments marking where the heath was on each side of the main road to Shrewsbury. These hutments are about 50 feet long and about 20 feet deep. Joiners and labourers are employed from all over the country in putting them up. It is stated that in addition to the thousands of infantry who will be accommodated on Prees Heath, batteries of artillery will be quartered in Bettisfield Park. The building of the huts finds employment for workmen at remunerative rates. Joiners are paid 9½d. an hour and labourers up to 7d. an hour. It is expected that the camp will be completed four or five weeks hence. —Chester Chronicle, 6 February 1915. ↑ 1.0 1.1 1.2 Tilstock Airfield Wikipedia: the free encyclopaedia. Accessed 26 August, 2016. This page was last edited on 17 November 2017, at 20:14.